Recipes are great for gathering inspiration, but what if a book worked with your unique taste preferences and allowed you to develop your own distinct culinary creations? 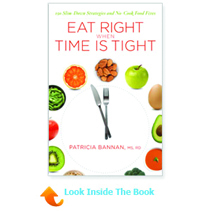 That is just what Karen Page’s newest book, The Vegetarian Flavor Bible, can help you do! This book is a wonderful resource for discovering new flavor pairings and constructing new takes on old favorites. 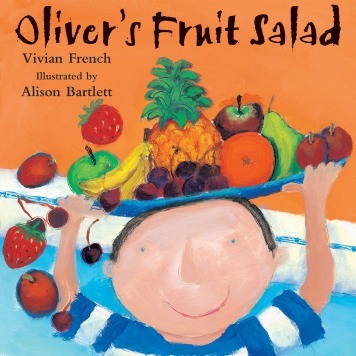 It is also a fantastic way to incorporate an abundance of heath-promoting fruits, vegetables, legumes, and whole grains into inventive family meals. We caught up with Ms. Page to chat about how this book can become a valuable tool for every kitchen. Why will our readers be interested in your book, The Vegetarian Flavor Bible? The Vegetarian Flavor Bible is a book dedicated to helping readers eat more healthfully and flavorfully – there’s no need to sacrifice one for the other! The Vegetarian Flavor Bible provides you with an encyclopedic A-to-Z guide to hundreds of plant-based ingredients – including vegetables, fruits, legumes, whole grains, nuts, seeds, mushrooms, and more – and tells you the herbs, spices, and other seasonings that best enhance their flavor. So there’s no need to sacrifice deliciousness in your pursuit of healthfulness, as The Vegetarian Flavor Bible will help guide you to both! It’s like cooking in reverse: Instead of buying a long list of ingredients and following a recipe step-by-step, you can simply improvise in your kitchen based on what you have on hand (e.g., some leftover vegetables and a spice rack), and your own particular preferences – so it’s sure to suit your taste. Can you tell me a little about your book and the personal connection you have to the topic? I am a lifelong omnivore and gastronomic hedonist who grew up eating meat three times a day – and the last person on earth I ever expected would become a vegetarian and love it! As professional food writers, my husband Andrew’s and my life included an ongoing pursuit of deliciousness – without any consideration for the healthfulness of what we were eating. However, in 2009, I lost my father to cancer – the fourth death from cancer in Andrew’s and my immediate family that decade. Finally, all of the headlines we’d been scanning that linked nutrition and wellness hit home, and we decided that we should try to eat more healthfully when we weren’t eating professionally. In The Omnivore’s Dilemma, Michael Pollan wrote, “In all my interviews with nutrition experts, the benefits of a plant-based diet provided the only point of universal consensus.” So we decided to eliminate meat from our diet. You don’t have to be vegetarian to benefit from boosting plant based foods, check out the Healthy Kids Today, Prevent Cancer Tomorrow campaign. Since May 2012, we’ve been eating 99 percent vegetarian, and by now we’re pretty much eating vegan at home and eating vegetarian as more of a last resort when we’re traveling – especially at airports or outside major cities. It’s been a surprise that this journey has affected us not only physically with our improved health, but also emotionally (e.g., greater compassion), mentally (e.g., greater clarity), and spiritually (e.g., a greater sense of connection to the planet and all its inhabitants). 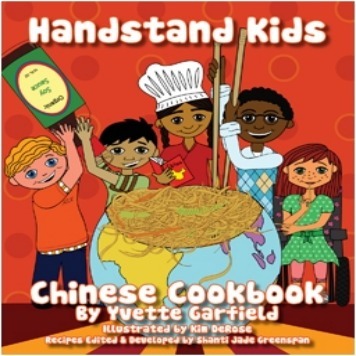 How do you think the wealth of knowledge contained in your book can help readers have more fun in the kitchen? Neither Andrew – a former restaurant chef – nor I have ever understood the “fun” of being tethered to a recipe telling you exactly what ingredients to buy and exactly what steps to follow to prepare those ingredients. Human beings are NOT robots! Fun is being engaged in coming up with a NEW dish, and not simply cranking out the old reliable dishes you just go through the motions to get on the table. To us, the fun in cooking is the spontaneity and the power to create something new that is customized to your and your family’s tastes and preferences. What are some of your favorite ways to make wholesome foods more appealing for kids? Meet your kids half-way by giving them dishes in a format they love – whether pasta or pizza or sandwiches. You can increase the ratio of veggies and/or legumes to pasta or pizza dough. And surprise them! Because salads are so stereotypically healthy, unless they’re salad lovers, they may be bored by a typical salad. So instead of loose leaves, serve a wedge salad made from Romaine that allows them to slice it themselves interactively. Or serve a “salad” as a kebab, spearing a variety of colored vegetables onto a skewer, accompanied by a flavorful dressing or dip. The kids we know love dips like pesto and Ranch dressing that add a lot of flavor. 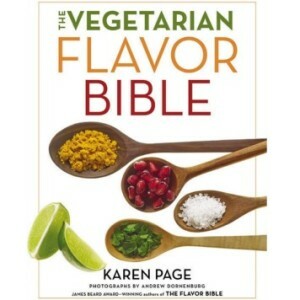 What were some new favorite foods or pairings you discovered as a result of writing The Vegetarian Flavor Bible? Andrew and I were happy to discover new ways of using some of our favorite ingredients. We both love lentils, and Andrew makes a great lentil soup. But while we were working on this book, we discovered the trick of seasoning lentils with Mexican spices – such as chili powder + coriander + cumin + oregano + smoked paprika – and some garlic + onions, and using that instead of ground meat at the bottom of our taco shells. Alternatively, you could season tofu that’s been frozen-then-thawed — which changes its texture to make it akin to ground meat — and cooked the same way [as you would meat] and use that instead. Garnished with lettuce, tomato, and salsa, both versions are delicious – and blindfolded, you’d be hard-pressed to tell the difference because of the similar flavors and textures. You mention in The Vegetarian Flavor Bible that you now embrace a whole-food, nutrient-dense diet. How has improved nutrition impacted your life? Tremendously! When I went back to school to earn my certificate in plant-based nutrition from Cornell in conjunction with the T. Colin Campbell Foundation, I learned that our bodies have their own self-healing mechanisms, but that they need the right nutrients in order to function properly. Since increasing the average nutrient density of the foods I eat – that is, significantly more vegetables, fruits, and legumes – I’ve found that I’ve lost weight easily for the first time in my life (losing more than 20 pounds since May 2012), and that my hair and skin feel moisturized from the inside out. My body feels like it’s functioning better on all levels, including being a faster runner. If you were limited to three herbs, spices, or other flavorings in your kitchen, which would you pick? Sorry – that’s impossible! As authors of The Flavor Bible, my husband Andrew and I love the broad range of flavors herbs and spices provide, so we could never limit ourselves. However, I would want an acid to brighten the flavor of foods, so I’d need some fresh lemon juice or a good vinegar. Andrew especially loves seasoning with smoked paprika, garlic, and mustard, so I’d always want to have those three in our kitchen to flavor his next creation. And I think some people underestimate the value of a sprinkling of fresh chopped Italian parsley on a dish! Herbs also taste great in home-made salad dressings!